Recipe for Classic Okra Soup: Classic Okra Soup. Do you want to prepare Okra Soup for your kids? Then visit the Kiddies Okra Soup page. 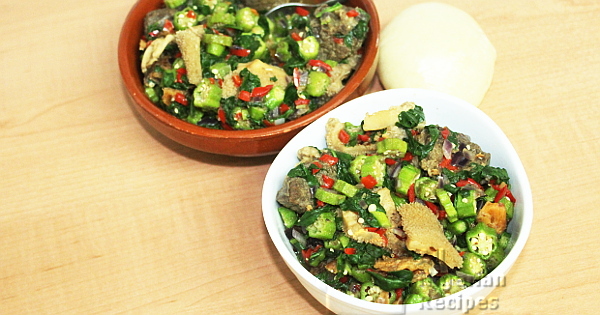 Do you want to add Ogbono to your Okra soup? Then visit the Okra Soup with Ogbono page. Recipe for Oiless Non-Slimy Okra Soup: Oiless Non-Slimy Okra Soup. This soup does not contain palm oil hence we will use the sweet pepper to add some colour to the soup. Pumpkin leaves are the best for okra soup but for those outside Nigeria, this may be hard to come by so you can use spinach. 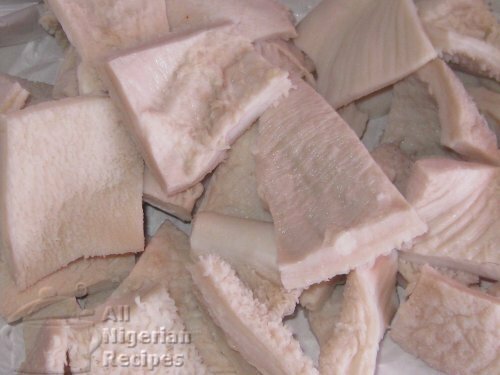 You can also use dry cat fish, smoked or boiled mackerel for this soup. If using tatashe, remember that it is hot and spicy. If you do not like spicy food, skip the habanero pepper. If you do not have crayfish, use fresh shrimps or prawns. Cut the okra into big chunks. The tinier you cut the okra, the more slimy it will be in the soup. Eat it on its own like pepper soup because it is quite filling or serve with Eba (Garri), Cassava Fufu, Semolina Fufu, Amala, Tuwo Shinkafa, or Pounded Yam.